Eternal Quest is the name of the game I started to develop for a LoFi jam over at RPGDX. As the theme was LoFi I deciced to do some NES influenced. I didn't manage to do much of anything under the 48 hours the jam lasted. You can download and test the walkaround demo I threw together -> demo. I am currently coding the shops that are pretty much done. It's more or less just a matter of how many of each kind of items there will be to buy. It's not going to be a long game so it's probably overkill to add for as an example 30 different armors. The fighting engine is also more or less finished. It's a matter of adding magic spells. Check out our newly designed site for Ragnarok Games for the latest news. Yeah, I'm trying pimp up the visitor numbers. I just hope this mini RPG will introduce something new compared to your other "kill 100 monsters in a winding path, few sub-bosses and then the final boss" mini RPGs. Add 2 or 3 paths to the final solution, some multi-choice dialogues and at least two cities. Add some minimal depth. It's not going to be a "go straight from point A to B and beat the big bad". It's having an overworld and will feature a couple of villages. That nice to hear. I'm holding you to your word. Playable Demo now!! Playable Demo Now!! BTW, are you planning on sticking to the NES palette for this? Because that would like rock...remember in Japan 16color graphics is still an artform...and no I didn't make that up, read it somewhere...ok...ok, I made it up. 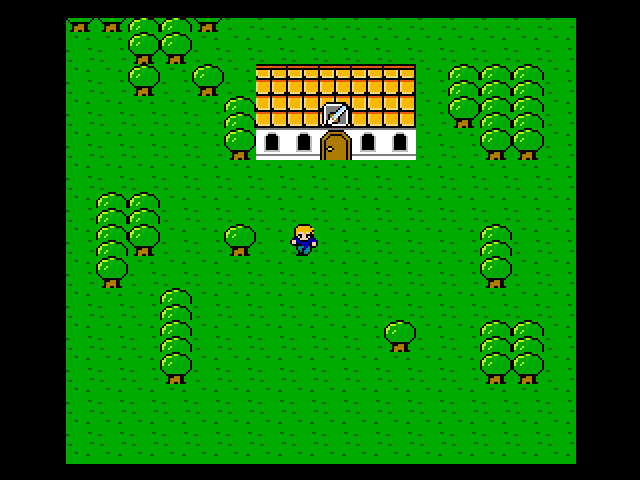 As far as I know, the game will be using 256x224 mock-resolution (320*240 Scale2X to 640x480) and standard NES palette. ok...ok, I made it up. Actually you didn't . It's just not limited to japan. Lachie have all the facts right. What do you know, well even a broken clock is right twice a day. Your screenshot is evil though, because it keeps making me want to pick up my DBOS library again. Damn, so much to do, so much to do...I need a legal form of crack...ok, doesn't have to be legal. P.S. Playable Demo Now!!! Playable Demo Now!!! Forgot about so. So I assume, nothing came about this project? It's not abandoned, I'm just taking a break from it. The break was just supposed to be for a few weeks and eh, expanded to alot of months. It's funny it's almost a year ago since I first posted about this project and I'm working on practically the same things. Well, I did take a break and I did start working on some other stuff but yet... almost a year ago. Loading and saving game works nicely now. The menus wasn't very fun to do. Some magic has been added to the battle engine. I have done some new graphics for the caves and houses. I'm currently replaced the standard font with something else. Nice to see this still being developed. Thanks BarMrBox. p.s. I know what you mean about taking a few weeks and end up being a year later before picking it back up again, but ever notice, only after a few minutes of coding, it's like you never left it? Yeah, it's kinda easy to get into the code again. I have fixed many minor things this weekend and the font is replaced.